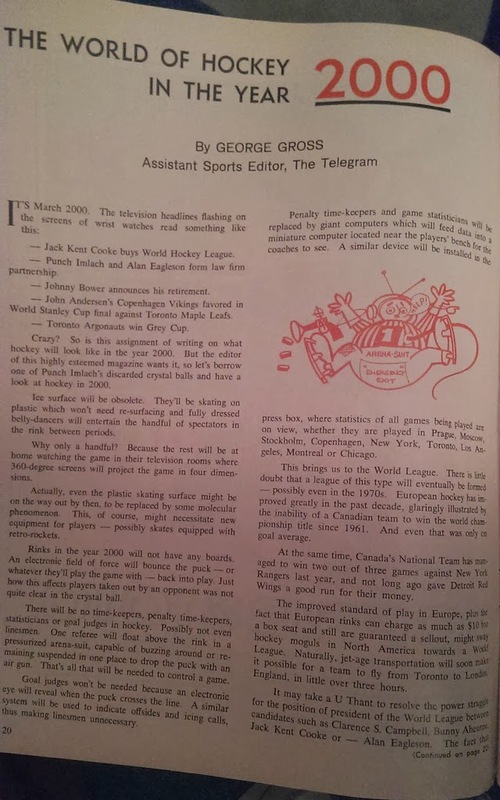 In 1967 George Cross predicted that in the 21st Century Ice Hockey games would no longer have boards round them to prevent the puck going out of bounds. Rather, he surmised that the game would be surrounded by a force field. This is rather a prosaic use of the futuristic concept of force-fields. However, lasers are used for life changing surgery on eyes and to improve self esteem in plastic surgery. They are not used that often as the weapon so beloved in Sci Fi stories of old. You never know what the future may hold. One thing that George Cross did not predict was that Ice Hockey would not be around. There were certain things he assumed would remain constant. But with the culture around us changing at a dizzying pace there is little that we can assume will remain constant. This is unsettling. However we can be confident that the Lord Jesus Christ will be here, the same Lord, Saviour and friend. He will be with us through next year - setting boundaries like an Ice Hockey force field might do and providing healing and self esteem like surgical lasers do. What will 2014 look like? I pray that whatever futuristic tech comes into everyday use, you will have a good year. To have a really good year means to "trust in the Lord and not lean on your own understanding". Let's trust the Lord Jesus Christ for not just a happy new year but a good year and a good eternity.